Discussion in 'Downhill & Freeride' started by TheMontashu, Apr 11, 2008. Just got my hands on a pair. No rides on them, although i did take a hammer to my knees. They do work, but they are ALOT different than normal plastic pads, you feel the impact alot more, to the point of almost kind of hurting. No matter how much harder you though it only is slightly bothersome. Still not sold on the things, we will see after a couple rides. Cool, im looking at them too. But not so sure on the D3o stuff lets get a review after some rides. How's the fit and everything? Have you ridden the kyle straits? 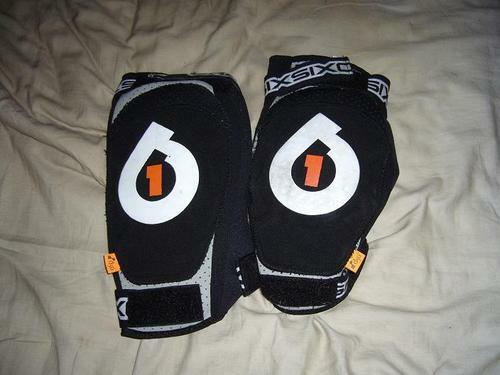 I'd be interested to see how they stack up to those since they are both a light duty knee pad. I was looking at getting a pair for dirt jumping or riding street. I currently don't ride anything while doing either (except helmet and gloves) but I thought those might be nice to take the edge off in a crash. I have knee/shin guards but they are too bulky for urban/jumping. I'm looking forward to a review. I received mine today and did exactly the same with a hammer. I was hoping they would react the way they did to the guy in the demo videos who got hit in the head with a shovel. They didn't harden as much as I thought they would. I consider it just a foam on steroids and not much of a replacement for plastic pads. I've yet to ride with them so we'll see how it goes. that's a little bit disappointing, but hopefully they work out. do they have less material on them than the kyle straits, or pretty much the same amount of foam? loren, creek this weekend. perhaps the space-age material has speed sensitive vavling and will stiffen more under harder hits. get a buddy to whack the knees harder w/ a bigger hammer and compare. Hmmm.....mine should be shipping today. Gotta remember though guys, these are race pads, not free-ride gear. Sounds a bit disappointing though that they don't harden up as much as they were touted to. I've been watching those things. I think they would be better in like a hip pad or something, but not a knee. I'm especially interested to see how they do sliding down a rock face or even a street. I think if they had a fat pad under them they'd be more feasible, but then why not just a hard cap? I think they do, but just very locally. I'm thinking everyone was expecting the whole evo insert to magically harden up...like Batman's cape. They are a little less material than the straits, we'll see how they work down in SC. i haven't read the supporting propaganda on the stuff, but it sounds like the gell functions as a non-newtonian liquid, kinda like when you mix cornstarch and water - the sutff is just a viscous, but fluid goo, but when you grab a handfull and squeeze it, it becomes firm and solid (insert joke here). mythbusters used it as an example on an episode they did to test myths about how ninjas walked on water. i'm sure that is on youtube somewhere. they filled a tub with water and cornstarch and adam was able to walk across it if he moved his feet fast enough, but when he stood still in it, he sank. the pressure from the steps solidified the goo for a jiffy, just long enough to support him taking another step. i think this stuff is the same concept. New 661 pads are in, mediums right now, larges next week... JYEAH. Got them here too, dunno. The d30 stuff doesn't feel like it does much? I think that the EVO stuff should have a thin (at least) hard shell over the EVO. I don't see those doing a thing for a sharp rock impact. Damn, that's what I don't want them to do, slide down and let me knee get scraped. My elbow pads slide down to my wrists all the time and I'm going to put some beads of silicone on it so it sticks better. My elbow pads slide down to my wrists all the time and I'm going to put some beads of silicone on it so it sticks better. or pulls off your hair as it slides down. i'm curious to see if anyone complains about the pads sliding down, i haven't heard anyone else mention that as being an issue. i agree that 661 should put something hard on the surface of the pad, a sharp stick or rock could potentially slice through the material. also, i'm assuming that the ability to dampen impacts is better if the impact is spread over the surface of the pad, so wouldn't the tip of a rock cause some damage? No go on the pads, the D3O tore a bit, I pulled D3O out to wash them and noticed that they are starting to tear. I'm going back to my tomcats. yeah... rocks... anyone had a chance or back luck to test evo knee pads on rocks? What is the material that covers a pad? rip-stop nylon? cordura? kevlar? Glad I did not rush out and pony up for them. I'd hesitated anyway, because they did not offer a knee/shin combo in the new goo. I was curious about them myself, but think I'll stick to my Kyle Straits for now. They have held up VERY well to almost 2 years of riding, and I haven't even begun to tear them yet. I've been thinking about a set of the DH knees and XC elbows for riding locally, which is more all-mountain with more pedally downhill sections. Full on padding is just a bit much around here. I think it would also be a great setup for Moab, especially LPS, but for Snowshoe, Keystone, and Whiteface, I definitely would prefer all of my Dainese stuff. Got a set of Kyle Straits this winter, no big crashes yet. But there ok for the kinda of XC riding I do. Only slightly annoying spinning, but well worth having on for the down runs. Love the Kyle Straits. They also saved my knees a couple of times. Some times I noticed, like when going way too fast on a slippery bridge and sliding all the way to the end on my side and others I didn't as I see some scratches I don't remember making! They never slid down and don't bother me at all while cycling. does anyone got the DL on when the storm trooper pads are gonna be out. Was just about to buy some, glad I read this thread first! I'll stick to my fox knee/shins for the time being. Has anyone tried the Race Face ones - the knee only DJ types? I'm thinking of those if I ever wanted to go for a knee only rather than my Race Face FR knee/shinnies.